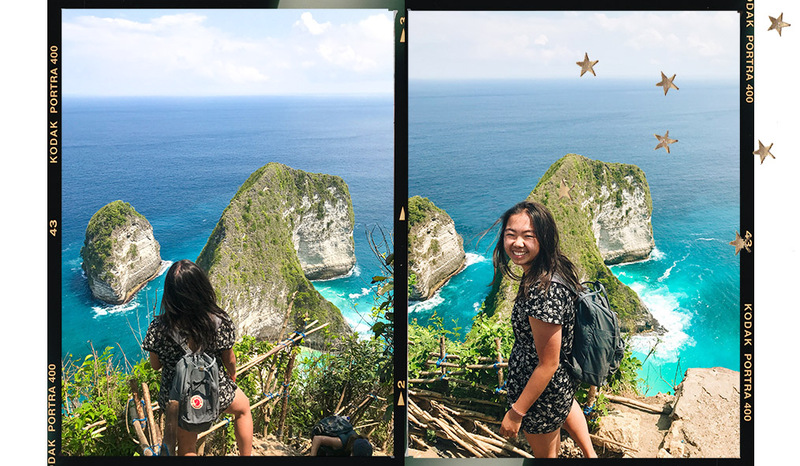 Bali was such a dream come true and I can't believe I was able to visit it! 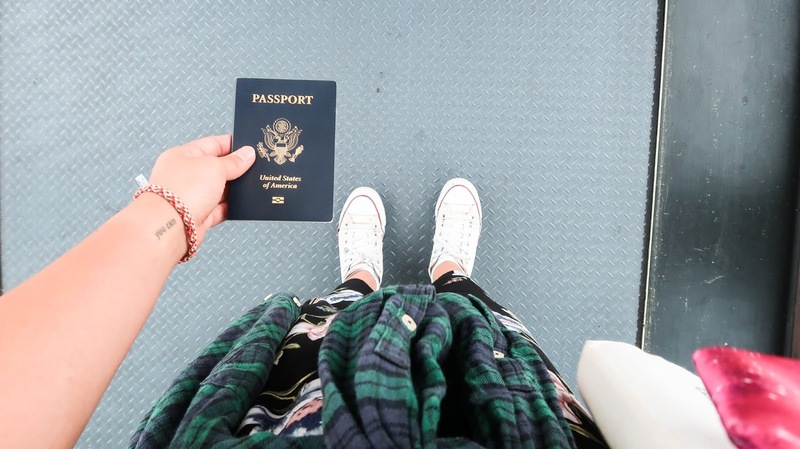 I love traveling because it opens my eyes to new cultures and experiences, and it also reminds me that there is so much more outside of my little Southern California bubble. Hello hello!! I recently went on a trip to Bali with my best friend and I did so much research beforehand, it's kind of insane. Bali is ridiculously beautiful and if you ever get the chance to go, you must!! But there's a lot to know and be informed about, so hopefully this blog post answers all of your questions. You'll arrive at Ngurah Rai airport in Denpasar. TIP: The airport can be very overwhelming so try and find transportation beforehand. If you do ride with one of the local taxi drivers, make sure to agree on a price beforehand. A ride from the airport towards the Seminyak area should be around 70,000 IDR but the most I would pay is 200,000 IDR (that's how much we paid for our hotel pickup). Go to the Departures hall and flag down a Bluebird that is dropping someone off. I've heard that Bluebirds aren't allowed to go to Arrivals so this is a lil hack that could work! Like most other countries, there are scams when it comes to exchanging money. We exhanged the majority of our money at the airport. Right when you exit, there will be banks/money exchanges on both sides of you. Both rates were the same but we decided to go with mandiri. I think we only lost a few dollars from what we exchanged so definitely a good rate! When we were out in the city and needed to exchange money, we would look for mandiri ATMs since we knew what the rates were. You can find them basically on every street if you're in the main part of town. They're normally inside Circle K's or mini marts. Obviously if the exchange rate is $1 for 14,500 IDR...don't trust it because it's clearly a scam (especially since as of 9/14/18, $1 = 14,384 IDR). I would recommend visiting around April - June and September, so towards the start or the end of high season. It'll be cheaper, less crowded, and the weather will be nicer too (less humidity is always a plus). It really depends on how much you want to explore. I was only there for 6 days which was not nearly enough time! If you're only going to stay in one city like Canggu or Seminyak, I think around 4-6 days would be plenty of time, considering all of these days are free days and you aren't driving to any other cities. If you're planning to hop around, I think 2 weeks would be best. 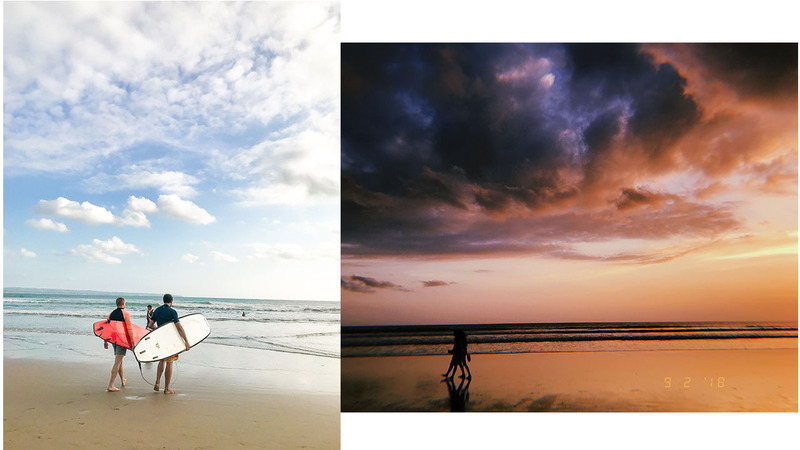 On my next trip back I would want to explore more of Canggu, Ubud, Uluwatu, and some of the other islands (e.g. Nusa Lembongan, Gili islands, etc). Honestly there's so much to explore and see, if you had a month, that would be ideal. Probably the most common and easiest way to get around. 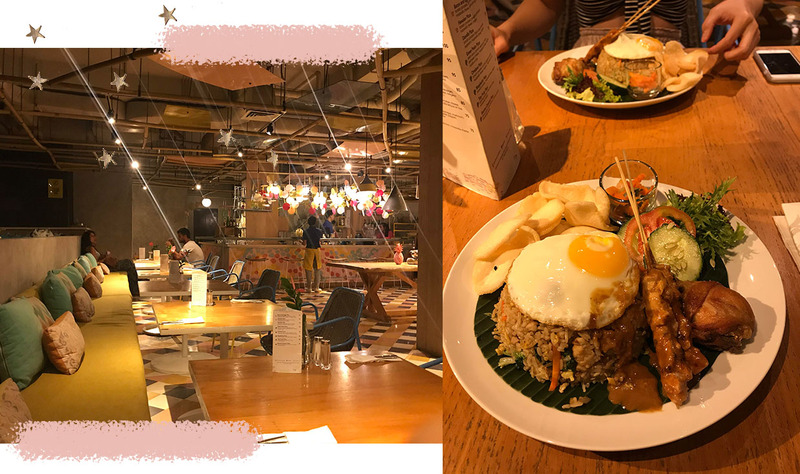 Unfortunately we didn't get the chance to rent any this time around (because yes, I totally chickened out but then regretted it on one of our free days) but we're planning to rent some on our next trip back to Bali. The roads are fairly even, paved, and easy to navigate. 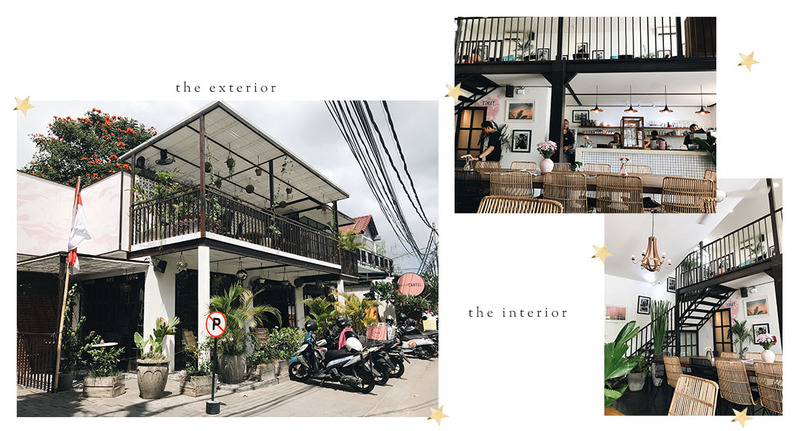 I think I was just nervous once we headed towards the more crowded roads (like when we were heading to Sanur), but since my friend and I were mostly around the Seminyak and Canggu area, the roads there seemed to be fairly easy to drive on. *This is also the most cost-effective way to get around the island! OK LISTEN UP. Taxis are a bit tricky in Bali because there's a lot of controversy surrounding ride apps like Uber, Grab, and Go-Jek vs. local taxi companies. Uber seems to be the most controversial one out there so we didn't risk it. But if you're willing to do it, prices through Uber are almost always half the price of a Grab or taxi. We only used Grab during our time there and never had any problems. I would normally just text the driver asking them if they wanted us to meet somewhere else. Another app to look into is Go-Jek (same concept). Bluebird is the "legit" taxi company in Bali because they use meters. There are many other local companies that try to imitate the look of Bluebird cars so just be sure to look at their website to make sure you're riding with a real one. If not, make sure you negotiate the price of the ride with the driver before you get in. I don't know if it's just me but I had a lot of trouble trying to find information about hiring private drivers and making sure they were reliable, trustworthy, and well-priced. 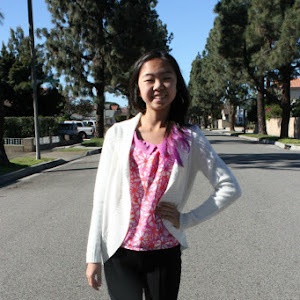 Personally, my friend and I ended up using Klook which was great and pretty affordable. It was only $30 for 10 hours, while most other drivers we found were upwards of $38+ (546,000 IDR+). Seminyak is definitely one of the more tourist-y destinations, so it was crowded and busier than the other cities we went to. 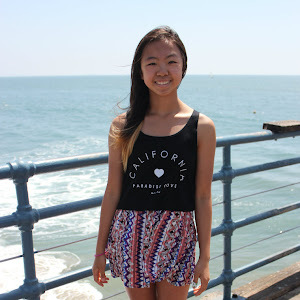 Come here if you want to explore some beautiful boutiques, cool bars, and chill by the beach. 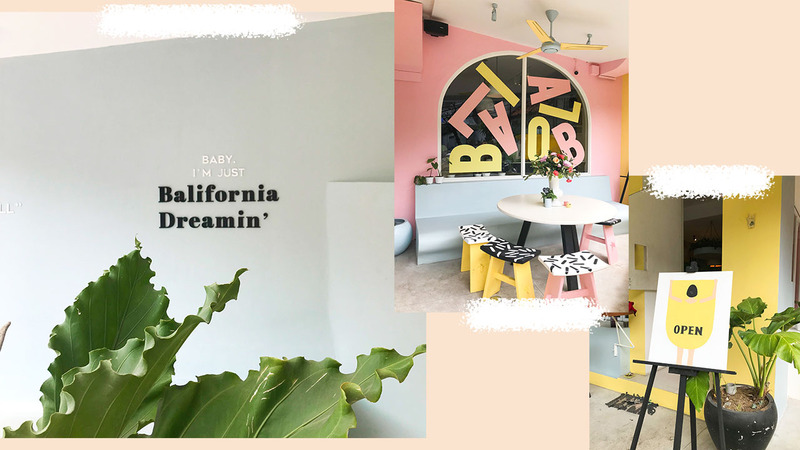 The next time we go back, we're planning to stay in Canggu for a few days! 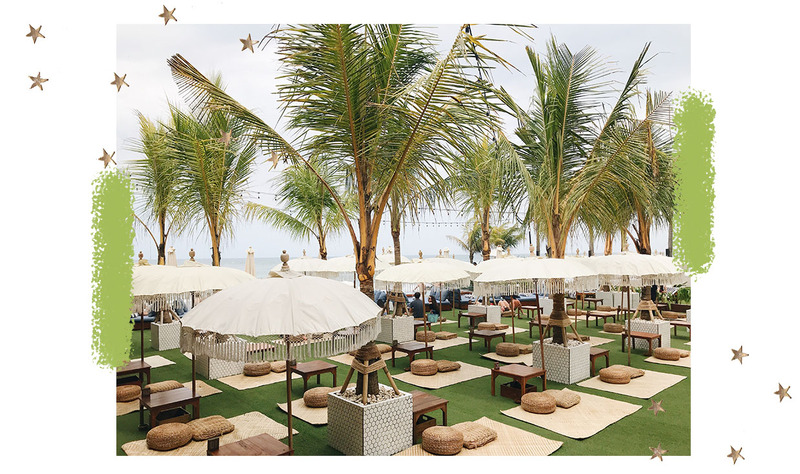 It's a quieter Seminyak, if you will. There's more of a lazy beach town vibe to this place, and the majority of our food places ended up being in this area. Unfortunately I didn't take many pictures of the streets but there were also many boutiques, cute cafes and restaurants, and there was even a flea market the day that we went. It was the cutest and such a cool spot! 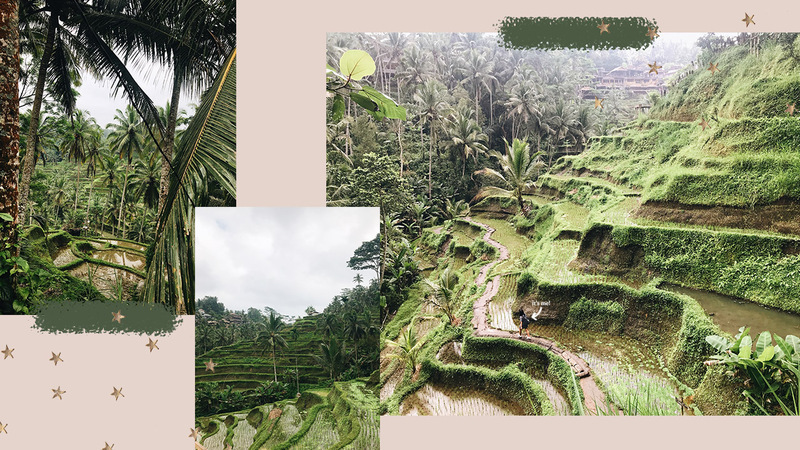 For Ubud, think- nature, yoga retreats, and rice terraces. I really wish we had more time to explore this city. It would have been nice to spend a day or two here just to relax and really get to know the area! While you're here: check out the Tegallalang Rice Terrace for some amazing views. There are swings that you can go on (usually at a cost) and swing over the rice fields. Highly recommend and try to go early to beat the crowds! We got there around 8:30 am and it was fairly empty but a lot of people started coming around 9:30 am. Entrance fee is about 10k IDR (less than $1). By far one of the coolest places I've ever visited. This little island is definitely a must-see if you go to Bali! We ended up booking a tour instead of driving around ourselves because I remember reading online about how rough the roads were so I didn't want to risk it. We hit up four spots- Broken Beach, Angel's Billabong, Kelingking Beach, and Crystal Bay. While you're here: I would also recommend spending at least 2-3 days here. There's so much to explore on this island- we didn't even get to see the whole other side! I would recommend renting out a scooter just so it's easier to get around and explore on your own time (even though roads are rough- just drive cautiously). Villas are actually super affordable and nice in Bali! If you're traveling in a group of 4+, it's so worth it and I'd highly recommend renting out a cute villa. Airbnbs are another option. You can find villas on here as well as other affordable options. Hotels are another great option if you like to just have things taken care of! We decided to go with an Expedia package (flight + hotel) and ended up staying at Tijili Hotel in Seminyak. Such a lovely hotel with great service, great location, and OMG the food was amazing!! Highly recommend checking out the restaurant even if you're not staying there. 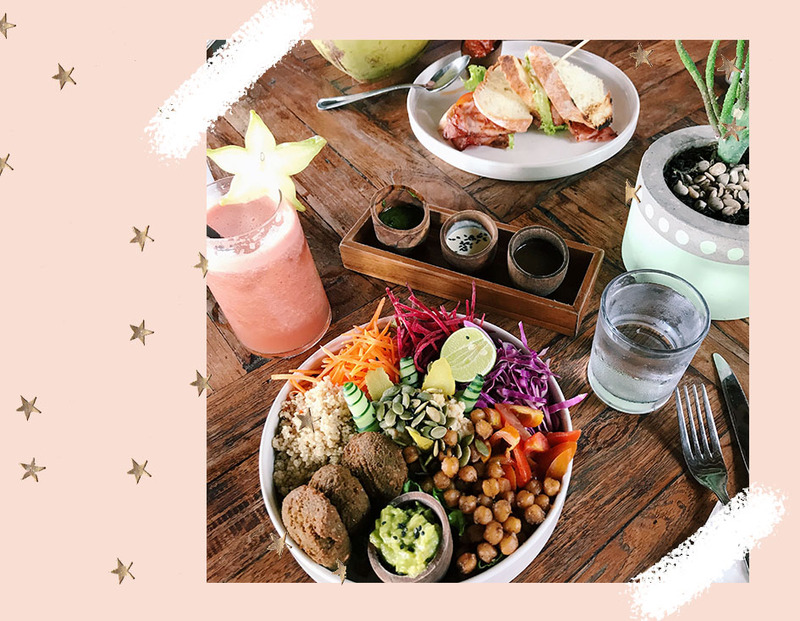 There are so many healthy food options in Bali and so many cute cafes to go to. 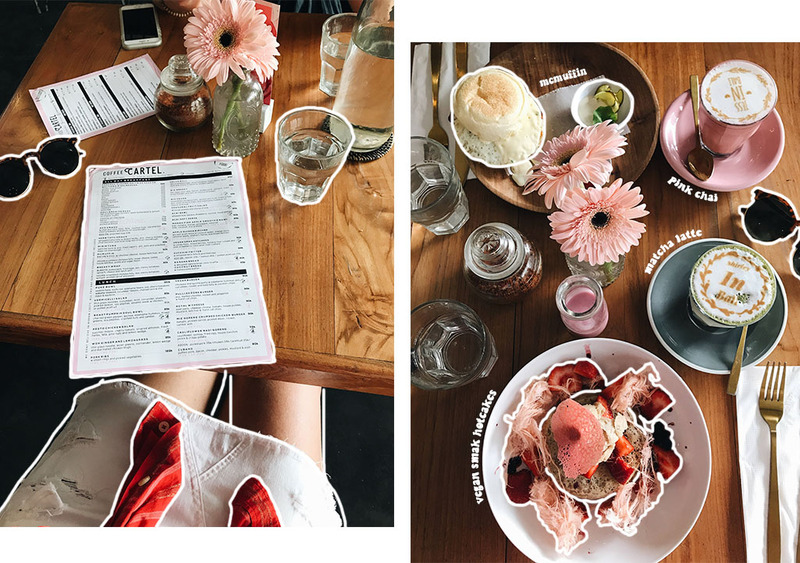 It's like an blogger's instagram feed come to life. I could probably just cafe hop for one day and have enough content for weeks! 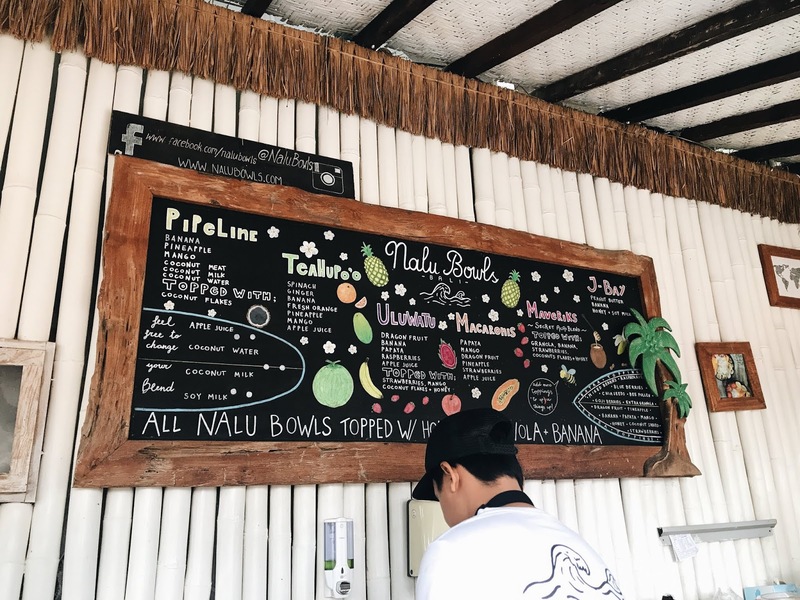 I like to pride myself in being an acai bowl connoisseur so when I read about Nalu Bowls, I knew I had to go! They claim to be the first ones to bring smoothie bowls to Bali soooo it's gotta be good right? RIGHT. It was SO good!! I was pleasantly surprised after being disappointed with an overhyped acai bowl the day before. 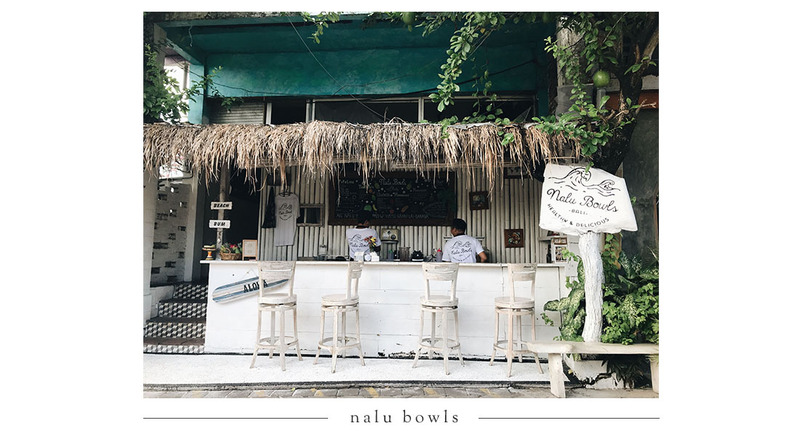 Nalu Bowls offers six different bowls with delicious and fresh ingredients. 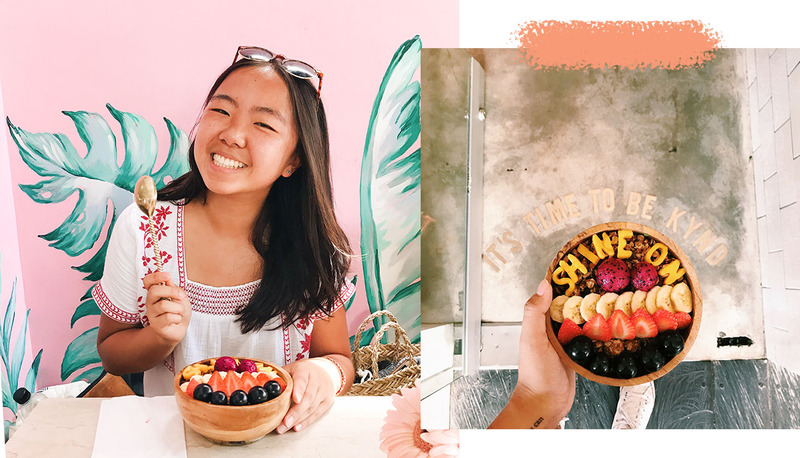 Their original is the "Mavericks" bowl, which includes their "secret acai blend" topped with the usual- granola, fresh fruit, and honey! They also had a green bowl and some pitaya/dragonfruit bowls as well. Jess and I decided to go for the Pipeline (Jess) and Uluwatu (me). I'm normally not a huge fan of pitaya bowls because I find that they usually don't have as much flavor or they're too tart, but this one was actually so good! It was topped with mango, strawberries, coconut flakes, granola, and banana. Highly recommend if you like pitaya bowls or if you're looking for something fresh and light! 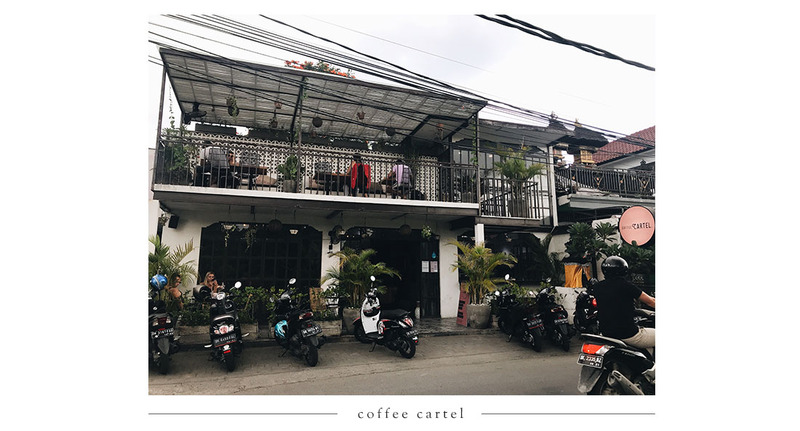 Coffee Cartel is known for their custom printed lattes and not going to lie, that's one of the main reasons why we decided to go (but also for their cute decor and incredible reviews). It's on the side of a road in the northern part of Seminyak and it was a very spacious place! They had two floors with a lot of outdoor seating and a nice interior as well. Also their customer service was out of this world. Everyone was so friendly and accommodating- honestly we could have just moved in there and I wouldn't have felt uncomfortable at all lol. BUT ANYWAY, we decided to order the lattes, pancakes, and a breakfast sandwich. And at the time the prices seemed a tad expensive for Bali but now looking at it...bruh this is so cheap LOL. Keep in mind though that the US dollar amount is reflective of the exchange rate as of 10-1-18 (because I am a procrastinator and this post is taking me months to finish). Not the greatest pancakes I've ever had (France does it better fyi), but still pretty good! Honestly they reminded me of the vegan pancakes that I usually cook at home so I guess it's just the texture of a vegan pancake? Really thick though! The candy floss was a little much because the pancakes + the sauce was already sweet enough. But it was pretty and pink and such a great photo op! 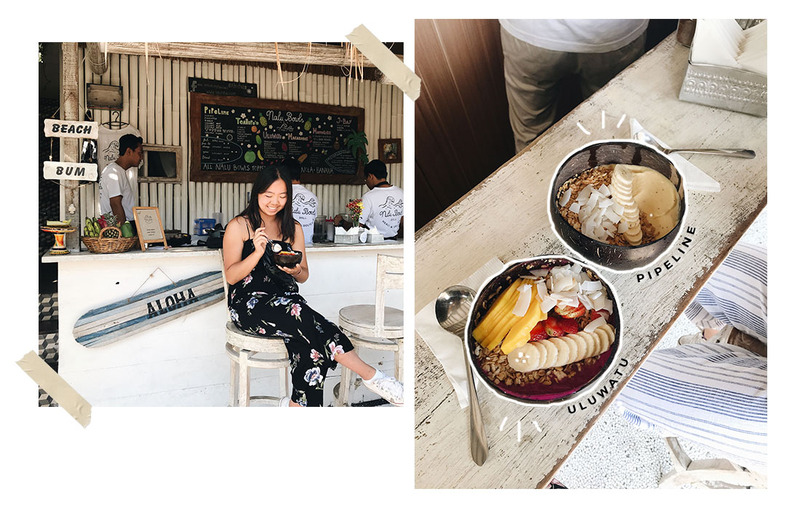 Did you really go to Bali if you didn't go to KYND and get one of those customized acai bowls? 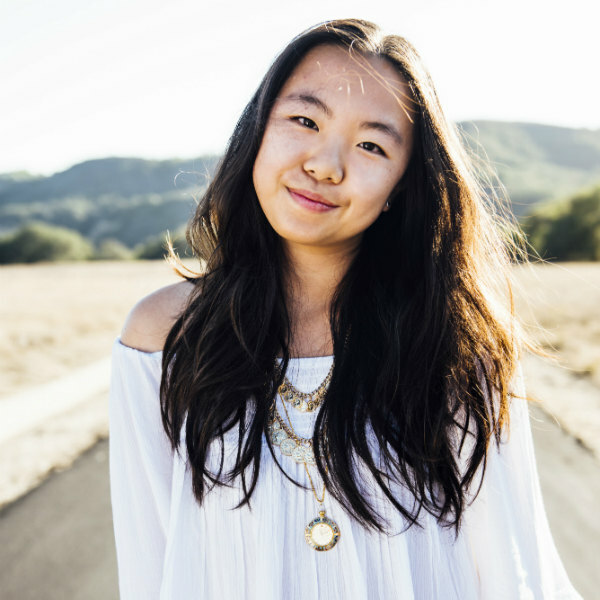 KYND was on the top of our list because we saw it everywhere on social media. We waited for just about 20 minutes or so (because we wanted to get the pink wall) before being seated. You place your order at the counter first and then they deliver your food to the table! We both ended up getting the same bowl because they were so popular and we both wanted to try it! In retrospect, we probably should have just ordered one bowl and then got another menu item instead. 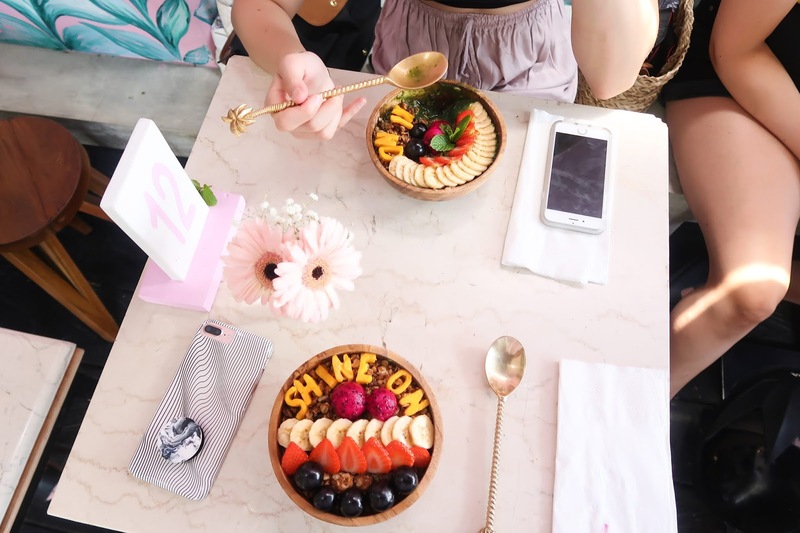 You can add custom words to your bowls (I believe it's a max of 8 letters), and I'm really surprised that juice bars in California haven't hopped on this train yet? It's so easy- just cookie cutters and some mango! I was super excited for this bowl so maybe I overhyped it a little but I was pretty disappointed with it 😔I understand that they're really busy and their bowls are one of the most popular menu items, but there was a huge lack in consistency with the bowls. Mine was really thick and sweet (probably too much banana), whereas Jessica's was a little thinner and more like a smoothie/juice. Overall it was a cute bowl and I mean...I ate it all LOL. BUT BARELY. It just ended up being too sweet for me! I heard the other items are amazing so I would probably come here if I'm ever in the area again. ALSO they just expanded and opened up a whole other section (literally 2 days after we left rip) so I can't wait to see all of that!! We actually walked by Balibola as we were waiting to be seated for KYND! I spotted the pastel yellows, pinks, and blues of the exterior and gasped when I saw that the sign read, "Balibola". 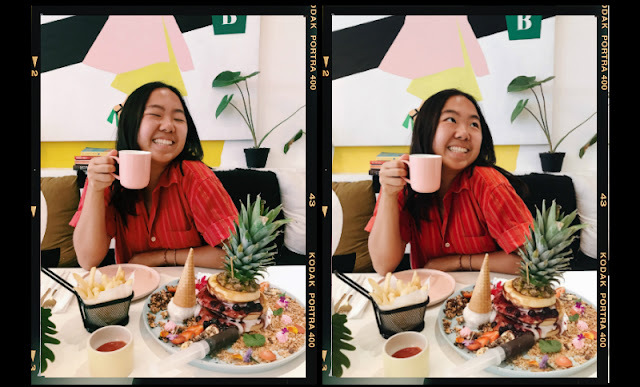 It was one of the places on my list because Lauren from @gypsea_lust posted about it and her meal looked so stunning, so it was a surprise to see how close it was. It was relatively quiet when we went inside but we were quickly attended to and seated immediately. The interior is so so cute you guys!! Their overall theme was very retro and mid century modern, and their colors were these beautiful pastel yellows, blues, and pinks. The service was great and everyone was really friendly. We were having trouble deciding what to eat and the waiter recommended their ricotta pancakes! We didn't expect it to be soooo massive, and I probably shouldn't have eaten it because I literally had pancakes for breakfast (I did feel sick after this meal 😬) BUT- it was really good. AND so cheap!! $8 total but we split it in half so it was just $4/person. oh my goodness. yo. you guys. The monstrosity that came out is just..what. even. How is this real. 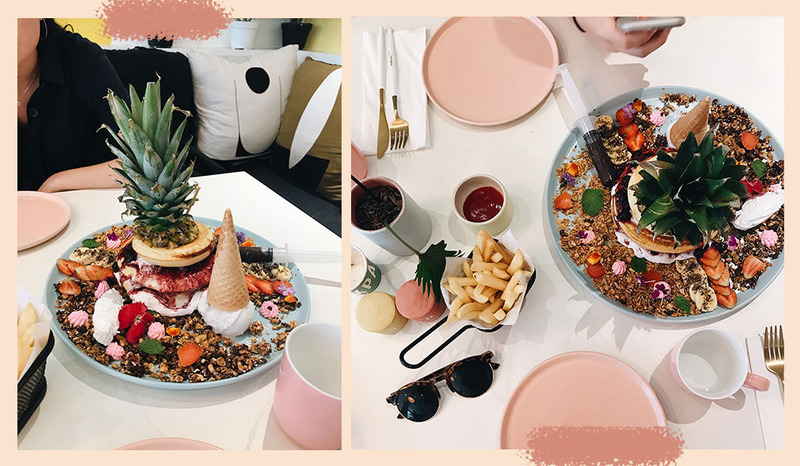 It was a stack of 3 thick fluffy pancakes with blueberry compote on top (+ a syringe filled with chocolate sauce), granola sprinkled around the plate, fresh coconut ice cream, and some fresh fruit too! We were destroyed by how delicious it was. *btw this is a dish that you should share. Would not recommend eating it by yourself but hey if you can do it, all the more power to ya! LOL this was our way to "balance" our sweet and savory meal. Solid french fries! Nothing too extraordinary, especially sitting next to their beautiful plate of pancakes. We were planning to get one of their smoothies (because they look insane) but I felt like I've been eating really heavy foods lately so I stuck to one of their juices. Got their watermelon + lime juice! Honestly a little disappointed with this one which is odd because how can I be disappointed with watermelon juice???? Maybe it just wasn't watermelon season or something? But it wasn't sweet at all, and the lime overpowered the watermelon taste. Probably should have gone with a smoothie! And of course, try your best to try out some local cuisine through some local restaurants. Our days were pretty packed and we had a lot of places we wanted to check out so we weren't able to. But those restaurants are a lot cheaper and just as delicious! 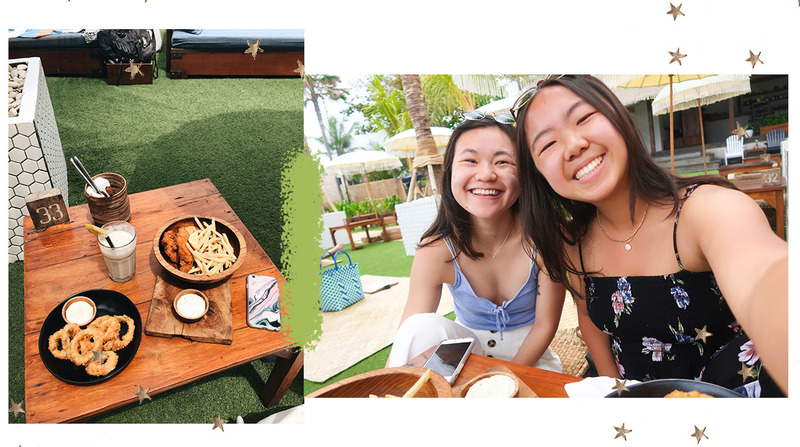 Going to a beach lounge was on our list of 'must do's so we found time in our schedule to squeeze one in! We headed to The Lawn in Canggu in the morning so it was less crowded and poppin. It was pretty gloomy this day but still hot and humid. We forgot to bring our swimsuits but there's a nice infinity pool and it's right by the beach! And you bet we regretted this meal right after!! LOL for some reason we never learn. We got the fish and chips, onion rings, and a banana smoothie #balance. Just kidding- we felt sick and gross after eating so many fried things. We probably should have stuck with a smoothie per person + one of these dishes, or one smoothie, one of these dishes, and a salad or something. But the food was actually pretty good and came out really quickly. Loved going here to chill and I think next time (when we're not on a time crunch), I'd bring a book to read and just spend a good chunk of the day here! Bali Belly was what I was most nervous about!! I hate throwing up (I feel like this is general consensus lol) so the thought of getting Bali Belly scared me so much. Plus I love food so the idea that it could betray me- UGH my heart. But luckily, Jess and I never got Bali Belly! We weren't extremely cautious or anything, but being more aware of the risk is important. Before heading to Bali, I'd recommend downloading Grab, Go-Jek, Bluebird, WhatsApp, and Units Plus (or some sort of conversion calculator). As I mentioned before, Grab, Go-Jek, and Bluebird are great apps to use for transportation (download Uber if you want too but use at your own risk). WhatsApp is how most people communicate, so if you hire a local driver they'll probably give you their WhatsApp! A conversion calculator is always helpful when you're bargaining or just trying to see how much you're actually spending. Here's a tip- pack. light. TRUST ME, you will want to buy literally everything. Unfortunately, Jess and I were flying from Shanghai with AirAsia where the carry-on policy is 7 kg (14 lb) for both the carry on and the personal item. So we actually only brought our backpacks and a small tote bag (lol still amazed at how we did this considering we are both over-packers). There are so many cute bags, home decor pieces, keychains, clothing, and boutiques everywhere so save up and save some room! If you have any additional questions, feel free to comment them down below. I have ALWAYS wanted to go to Bali! I am definitely bookmarking this for when I eventually end up going. Also I love the gifs in this post - so unique and fun! ah YES Megan, Bali is such a dream and I really hope you get to visit some time!! Wow this post made me want to go even more, looks so relaxing and the colors are so enticing! Hopefully if and when I get married this is where I will go lol! 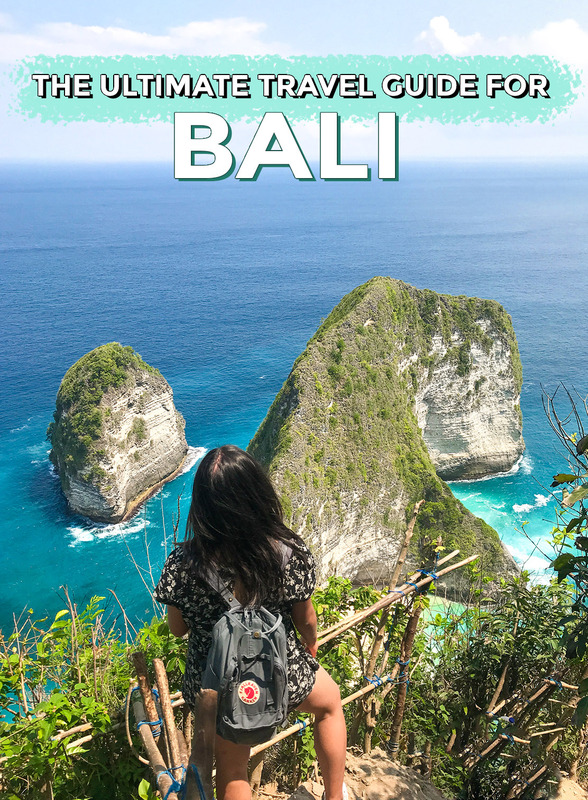 ahh you definitely have to check out Bali!! Super relaxing and fun to explore. I just used Google Photos for the gifs :) Thank you so much for reading, Adriana!